If you really enjoy slaughtering undead soldiers of the Axis powers, the folks at Activision have got you covered. 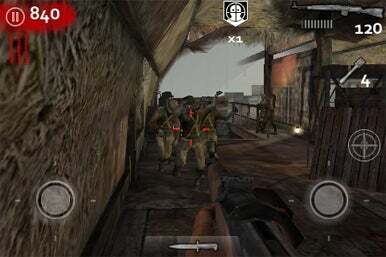 Call of Duty: World at War: Zombies II is available as a $5 upgrade for those who downloaded the original, or for $10 as a standalone app in the iTunes store. This first-person shooter game is clearly made for fans of the original and lite versions, because it doesn’t come with any sort of tutorial or elaborate backstory to give context. Questions abound: Who are you? Why are you here? And perhaps more importantly, why do all your former enemies keep resurrecting as zombies? The new map is called Shi No Numa (Zombie Swamp). If that doesn't sound German, it's because it's not: Activision has traded out the Nazi zombies for undead soldiers taken from the ranks of the Imperial Army of Japan. Nazi zombies, frankly, just sound cooler. I’m not sure if the controls are more responsive in this game or I’ve just played so many of these that I’m truly getting the hang of it, but the aim-tap-shoot drill seems a little more natural this time around. The controls are dual-stick and you can adjust them to your needs, but they are still frustratingly clunky at times, particularly when you’re trying to keep track of zombies flanking you. Shi No Numa is a noticeably more difficult map than its predecessors, particularly when a completely unexpected pack of hellhounds shows up around the fourth wave. Other than that, the “swamp” is a familiar bombed-out, post-apocalyptic building teeming with the undead. You've seen one spooky haunted bunker, you've seen them all. Kills earn you points to pick up new weapons, clear rubble, and repair barricades to slow down the onslaught. Co-op allows you to play friends on Bluetooth, or up to four people either locally through Wi-Fi or around the world online, as one of four international characters. A player profile, achievement list, and worldwide leaderboard round out the extras. Despite fans' protests, Activision is sticking with the atrocious 10 bucks-a-pop business model. The company knows people will still download the app in droves, believing the level of quality merits the high-price tag. It doesn't. Even selling Shi No Numa as a $5 in-app upgrade is too much, making Zombies II less a sequel than a cash-in on a new map.